Fentanyl is a powerful synthetic opioid used in medicine as anesthetic. It has been passed off as drug for about fifteen years in the Estonian streets - European Union member country - being tens times more powerful than heroin and about hundred times more powerful than morphine. For this reason fentanyl has completely replaced all other drugs and in Tallinn, the capital of the country, causes about fifteen overdose cases per day, a huge number in a city counting 400.000 inhabitants. Estonia has the highest number of per capita drug fatalities anywhere in Europe. The European deaths average that could be attributed to drug abuse is of 19.2 deaths per 1 million inhabitants. 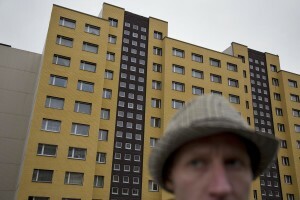 In Estonia instead there are 113 deaths per million inhabitants. Igor, Nik and Aleksei prepare syringes of fentanyl inside Igor’s house in Lasnamae district, an area where drug addicts usually go to use drug in Tallinn, Estonia on March 22, 2017. 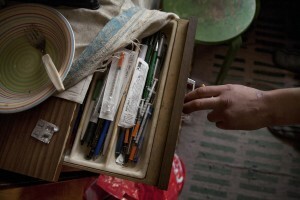 Igor, 33 years old prepares a syringe of fentanyl in his house in Lasnamae district, an area where drug addicts usually go to inject fentanyl in Tallinn, Estonia on March 22, 2017. Igor has been using fentanyl for about fifteen years. Before becoming a fentanyl dependent Igor was a military of the Estonian army. Aleksei, 46 years old is seen under the influence of fentanyl inside Igor’s house in Lasnamae district, an area where drug addicts usually go to inject fentanyl in Tallinn, Estonia on March 22, 2017. 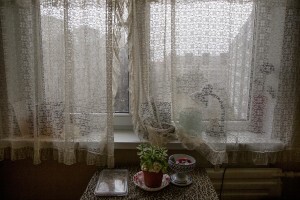 The window of Igor’s house in Lasnamae district, an area where drug addicts usually go to inject fentanyl in Tallinn, Estonia on March 22, 2017. Igor has been using fentanyl for about fifteen years, since his wife left him. Before becoming a fentanyl dependent Igor was a military of the Estonian army. Karl, 26 years old, prepares a syringe of fentanyl inside the toilet of a shopping center of Kopli, Tallinn, Estonia on March 16, 2017. Kopli is considered one of the neighborhoods with the higest number of fentanyl addicts in the city. A general view of the city from Toompea hill in Tallinn, Estonia on March 17, 2017. Karl, 26 years old, injects a dose of fentanyl inside the toilet of a shopping center of Kopli, Tallinn, Estonia on March 16, 2017. Kopli is considered one of the neighborhoods with the higest number of fentanyl addicts in the city. Karl, 26 years old, is seen under the influence of fentanyl in a park of Kopli, in Tallinn, Estonia on March 16, 2017. Kopli is considered one of the neighborhoods with the higest number of fentanyl addicts in the city. 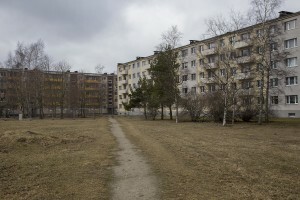 Palaces of Kopli district in Tallinn, Estonia on March 18, 2017. Kopli is considered one of the neighborhoods with the higest number of fentanyl addicts in the city. Tarmo, 33 years old and fentanyl addict from about twenty years, is seen inside Convictus center getting new syringes in Tallinn, Estonia on March 19, 2017. Convictus is a center which has been offering syringe exchange and social/psychological counseling to injecting drug addicts since 2003. 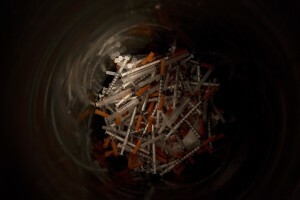 Hundreds of syringes used by fentanyl addicts are seen inside of a bin at Convictus center in Tallinn, Estonia on March 17, 2017. Convictus is a center which has been offering syringe exchange and social/psychological counseling to injecting drug addicts since 2003. Andrei, 50 years old relaxes on a sofa of Convictus center in Tallinn, Estonia on March 20, 2017. 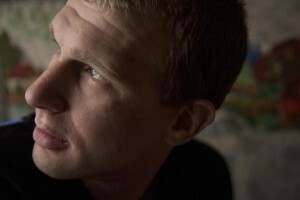 Andrei has been using fentanyl for about five years, since he was arrested for drug possession in 2007 and released after one year and half. He has been working for about eight years at Convictus center trying to help people to stop drug use. Tarmo, 33 years old and Mart, 35 years old inject a dose of fentanyl inside a park of Majaka, in Tallinn, Estonia on March 19, 2017. Majaka is considered to be among the neighborhoods with the higest number of fentanyl addicts in the city. Tarmo, 33 years old and fentanyl addict for about twenty years, is seen under the influence of fentanyl in a park of Majaka, in Tallinn, Estonia on March 19, 2017. Majaka is considered to be among the neighborhoods with the higest number of fentanyl addicts in the city. Tarmo, 33 years old and fentanyl addict for about twenty years injects a dose of fentanyl inside a park of Majaka, in Tallinn, Estonia on March 19, 2017. Majaka is considered to be among the neighborhoods with the higest number of fentanyl addicts in the city. Roland, 28 years old retains syringes and fentanyl doses in the drawer of his bedroom in Majaka district, in Tallinn, Estonia on March 19, 2017. Roland has been using fentanyl for about fifteen years and he is sick of HIV. Roland, 28 years old injects a dose of fentanyl inside his huose in Majaka district, in Tallinn, Estonia on March 19, 2017. Roland has been using fentanyl for about fifteen years and he is sick of HIV. Roland, 28 years old is seen in his huose in Majaka district, in Tallinn, Estonia on March 19, 2017. Roland has been using fentanyl for about fifteen years and he is sick of HIV. Roland, 28 years old is seen on the bed of his house under the influence of fentanyl in Majaka district, in Tallinn, Estonia on March 19, 2017. Roland has been using fentanyl for about fifteen years and he is sick of HIV. 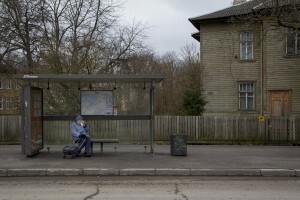 A woman waits for the bus sitting on a bench of a bus stop in Kopli, a suburb of Tallinn, Estonia on March 18, 2017. Kopli is considered one of the neighborhoods with the higest number of fentanyl addicts in the city. 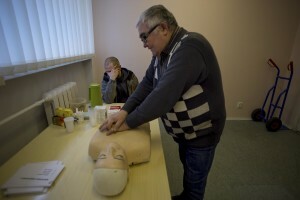 Doctor Nikolai Jaroslavtsev explains to a drug user how to help a friend in case of overdose inside a room of Convictus center in Tallinn, Estonia on March 21, 2017. Convictus is a center which has been offering syringe exchange and social/psychological counseling to injecting drug addicts since 2003. Svetlana, social worker at Tugikeskus aids and support center is seen during a break in Tallinn, Estonia on March 22, 2017. Tugikeskus is a non-governmental organization (NGO) which was founded in 1994 by a group of volunteers. Arthur, 23 years old sits on a sofa in Tugikeskus aids and support center after his methadone treatment in Tallinn, Estonia on March 22, 2017. Arthur has been using fentanyl for about five years. From 2013 to 2015 he has been in prison since he was discovered selling fentanyl in the street and because of his drug problems he doesn’t hear his family for two years. 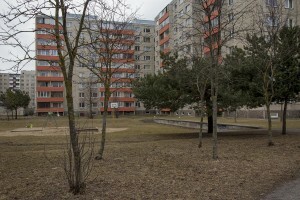 Typical Estonian houses in Kopli, a suburb of Tallinn, Estonia on March 18, 2017. Kopli is considered one of the neighborhoods with the higest number of fentanyl addicts in the city. 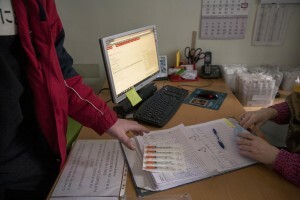 Igor, 33 years old is seen in his house in Lasnamae district where drug addicts usually go to inject fentanyl in Tallinn, Estonia on March 20, 2017. Igor has been using fentanyl for about fifteen years. Before becoming a fentanyl dependent Igor was a military of the Estonian army. 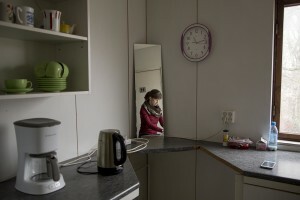 Igor, 33 years old is seen in his house in Lasnamae district, an area where drug addicts usually go to inject fentanyl in Tallinn, Estonia on March 22, 2017. Igor has been using fentanyl for about fifteen years. Before becoming a fentanyl dependent Igor was a military of the Estonian army. 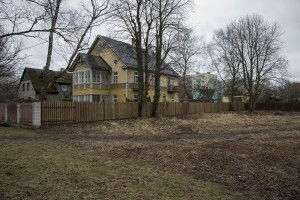 A park in Lasnamae district where drug addicts usually go to inject fentanyl in Tallinn, Estonia on March 20, 2017. Mart, 35 years old and fentanyl addict for about twenty years injects a dose of fentanyl inside a park of Majaka, in Tallinn, Estonia on March 19, 2017. Majaka is considered to be among the neighborhoods with the higest number of fentanyl addicts in the city. Igor, 33 years old is seen in Lasnamae district where drug addicts usually go to inject fentanyl in Tallinn, Estonia on March 20, 2017. Igor has been using fentanyl for about fifteen years. Before becoming a fentanyl dependent Igor was a military of the Estonian army. Igor, 33 years old is seen in a bus going to Majaka in order to buy a dose of fentanyl in Tallinn, Estonia on March 20, 2017. Igor has been using fentanyl for about fifteen years. Before becoming a fentanyl dependent Igor was a military of the Estonian army. Igor, 33 years old prepares a syringe of fentanyl in a park of Majaka in Tallinn, Estonia on March 20, 2017. Igor has been using fentanyl for about fifteen years. Before becoming a fentanyl dependent Igor was a military of the Estonian army. Igor, 33 years old injects a dose of fentanyl in a park of Majaka in Tallinn, Estonia on March 20, 2017. Igor has been using fentanyl for about fifteen years. Before becoming a fentanyl dependent Igor was a military of the Estonian army. Igor, 33 years old walks in a street of the city after injecting a dose of fentanyl in central Tallinn, Estonia on March 22, 2017. Igor has been using fentanyl for about fifteen years. Before becoming a fentanyl dependent Igor was a military of the Estonian army.